Topped with a heavenly brown sugar cream cheese frosting, these moist Carrot Cake cupcakes have just the right amount of spice, and will be perfect for any Spring or Easter celebrations! Carrot Cake is one of those desserts that I don’t make very often – definitely for Easter, and sometimes for random occasions. But every time I do, I remember how much I love it. Talk about a tasty way to get your daily dose of vegetables! 😉 This time around, I opted for making cupcakes instead of an entire cake. They were fun to serve, and even more fun to eat! These delightful cupcakes are moist and delicious, with just the right amount of spice. And the consistency is the perfect happy medium between dense and fluffy. 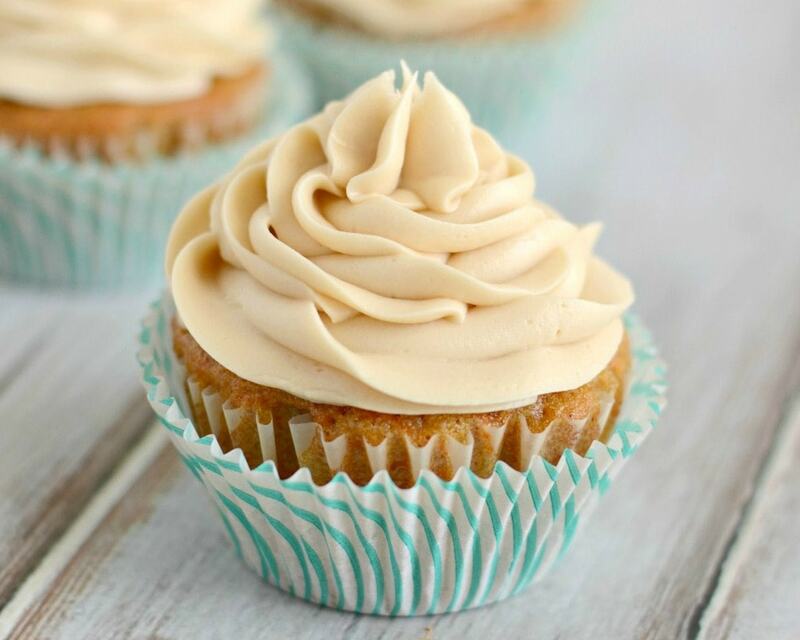 Top it all off with some homemade brown sugar frosting, and you’ve got yourself one tasty treat! 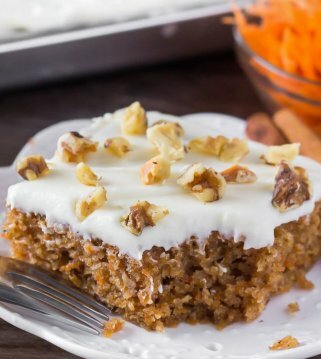 One thing to remember is that carrot cake doesn’t really taste like carrots, but they add the perfect flavor combined with all the spices in this dessert. 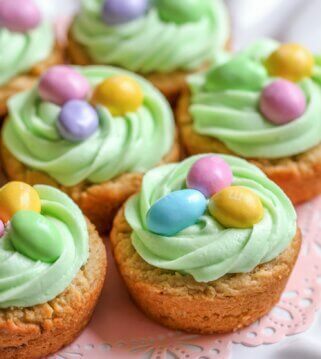 These cupcakes are so easy to make and will be the perfect addition to your Spring and Easter celebrations. They’re also great for feeding a crowd. To make, begin by whisking together flour, soda, baking powder, cinnamon, and salt in a small bowl. Set aside. In a large mixing bowl, beat sugar, eggs, and oil till thick and foamy, 1-2 minutes. Add the sour cream, vanilla, and carrots and mix well. Add the dry ingredients and stir till just blended. Fill paper lined cupcake pans half full. Bake at 350° for 18-20 minutes. Cool completely. 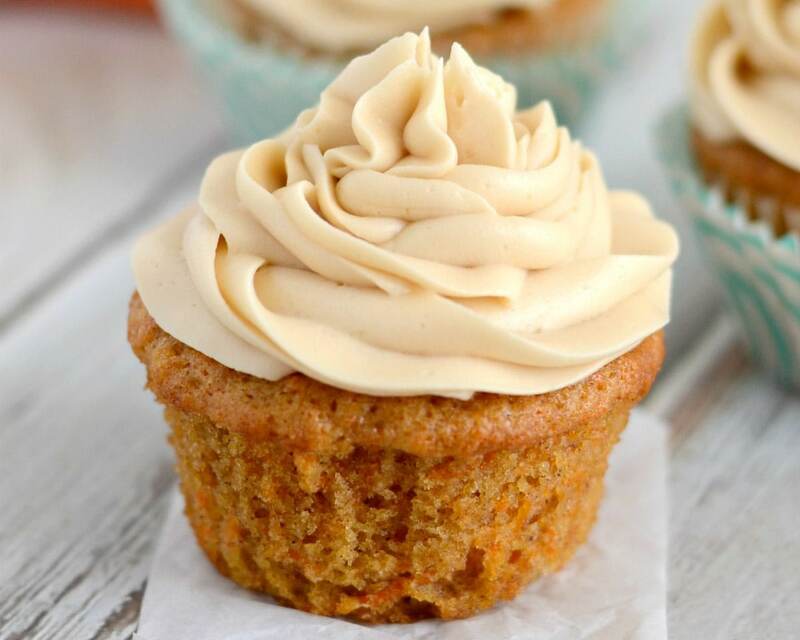 NOTE: These carrot cupcakes are simple to make, but here are a few tips. Don’t overfill the cupcake liners. They should be about 2/3 full. The cupcakes do not rise too much, and that is just fine. It’s easier to frost them that way! Have you ever tried making brown sugar cream cheese frosting? It literally is the icing on the cake – or cupcake for this recipe. Let me tell you, this is not your typical cream cheese frosting recipe. Brown sugar + cream cheese adds a rich depth of flavor to the frosting. It was so yummy that I was tempted to eat it by the spoonful. To make it, beat together cream cheese, butter, and brown sugar till smooth. Let it sit for 5-10 minutes until the brown sugar dissolves completely. Add vanilla, salt, and enough powdered sugar to make a frosting thick enough to pipe. To frost these cupcakes, we used a large star tip to pipe on the frosting, but you can use whatever frosting method you prefer. If you’re planning on spreading the frosting on, you can cut the recipe in half and still have more than enough. Some popular items to add to carrot cake include walnuts, pecans, and raisins. You can add any of those things to the batter before baking (between 1/2 and 1 cup of add-ins total), or add the chopped nuts to the top of the frosting! For those of you who like pineapple in your carrot cake, try reducing your grated carrots to 1 cup and then adding in 1 cup of crushed pineapple (drained). It might produce a little bit different of a consistency because there will be more moisture. Want bite-sized carrot cupcakes? 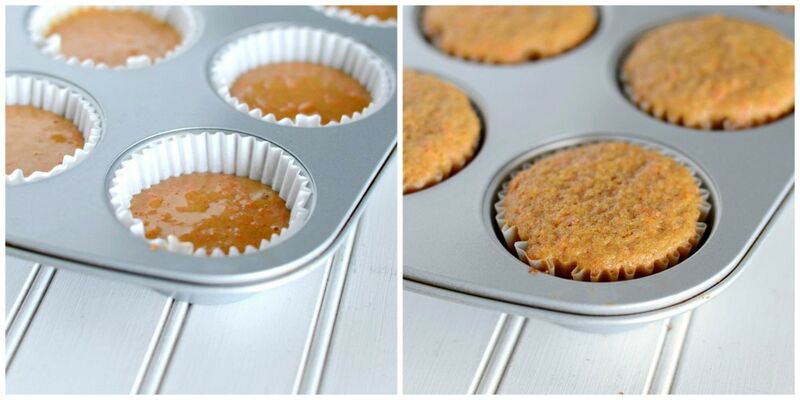 Simply follow the recipe exactly and fill the mini muffin liners (in a mini muffin tin) halfway. This will likely be about 1-2 Tbsp of batter for each mini cupcake. Bake at 350 for 10-15 minutes. If you already put frosting on the cupcakes, they can’t sit out at room temp for long, otherwise the cream cheese in the frosting will go bad. Preferably, store them in the fridge in an airtight container. If you are waiting to frost them, you can store the plain cupcakes at room temperature for up to 3 days. 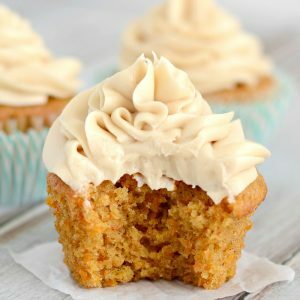 Can carrot cake cupcakes be frozen? 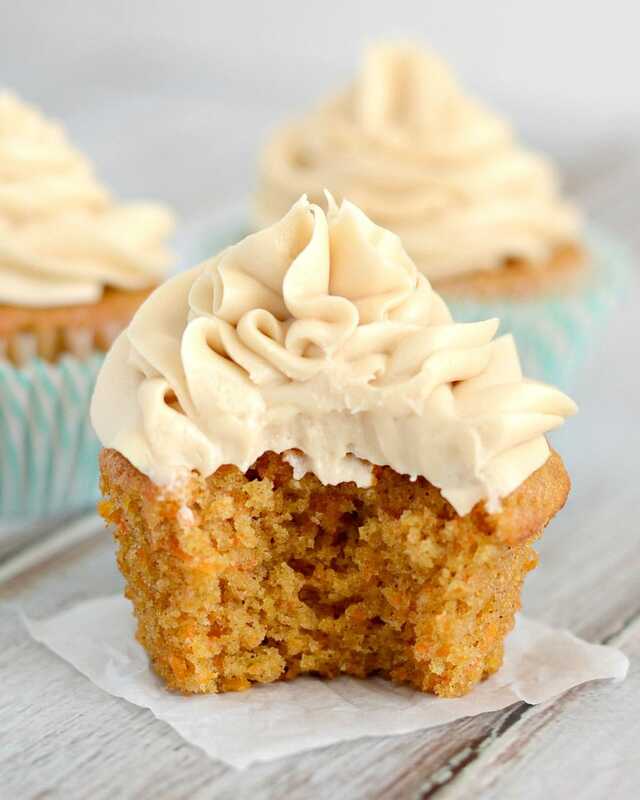 Carrot is one of the best cakes (or cupcakes) when it comes to freezing. It will hold up really well in the freezer. It’s best to freeze them before they have been frosted, but cream cheese frosting freezes well too, so it’s not a problem if they are frosted. Either way, simply put the cupcakes in an airtight container or heavy duty freezer bag (taking care to not smash any frosting), and store in the freezer 4-6 months. I hope you’ll give these cupcakes a try. They might just become a new favorite after one bite! Whisk together flour, soda, baking powder, cinnamon, and salt in a small bowl. Set aside. For frosting, beat together cream cheese, butter, and brown sugar till smooth. Let sit for 5-10 minutes till brown sugar dissolves completely. Add vanilla, salt, and enough powdered sugar to make a frosting thick enough to pipe. Use a large star tip to frost cupcakes. This makes enough frosting to generously pipe frosting on the cupcakes. If you will be spreading it on, you can cut the recipe in half. I’m dying over that Brown Sugar Cream Cheese Frosting!! Seriously, that looks like a total dream. Thanks for sharing with us, Kara! These look amazing. For more delicious recipes by her, head on over to Creations by Kara! I really want to make these but I love pineapple tidbits in my carrot cake. Do you think I would need to do anything different if I add them to combat the extra moisture? I wish I knew. I haven’t tried adding pineapple. Maybe just squeeze the liquid out of it first. Wish I could be of more help. Good luck! Will the recipe work good for a cake? I made these as cupcakes last week and they were amazing. I haven’t tried, but I don’t see why not. I’m glad you liked them! Thank you. If you try it as a cake, let me know how it turns out. I just made these and they are wonderful! The cupcakes are yummy and moist and the frosting is amazing! I added some pecans to the batter before baking and next time I’ll try raisins. Thanks for sharing! The carrot cake cupcakes are delicious! I added some pecans and they were moist and flavorful. The frosting was amazing! Thanks for sharing. Glad to share!! I am so glad you liked them! Thank you for letting me know! Should I be using light or dark brown sugar for the frosting? I like to use light when I bake 🙂 Hope that helps and hope you like it! Hey! Can you suggest an alternative for sour cream? I can’t find any here in my country ???? You could try buttermilk. I would just google the amounts though. Hope that helps! 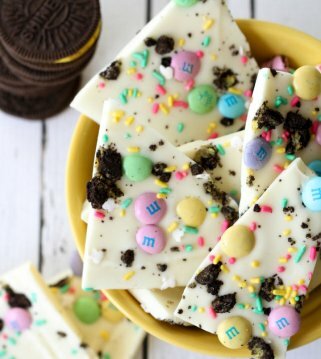 I made these yesterday and OMG! Sooo good. The brown sugar frosting is to die for! Glad you liked it! Thank you for sharing! These sound delicious! I can’t wait to try them! Thank you for the great recipe. You are so welcome!! Thank you so much for letting me know & for trying them!! 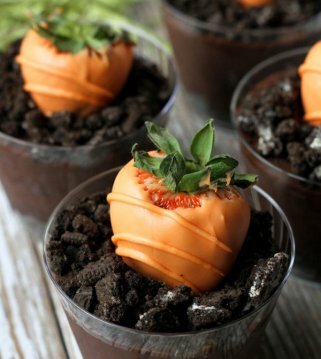 These were delicious and easy to make. I cut the sugar to 3/4 for the cupcake and with the frosting, it was hardly noticeable. I’ll be making these again soon! Yay!! Thank you for letting me know!! Will these be ok in the fridge after baking? I was wanting to make them the night before Easter. I am sure they will 🙂 They will be a hit! 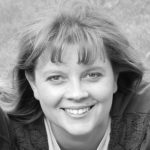 I cannot get canola oil anywhere where I live what can I use instead? do you use plain or self rising flour , and can you use cake flour ? I just use all purpose flour. I am sure you could use cake flour, though I personally haven’t tried. 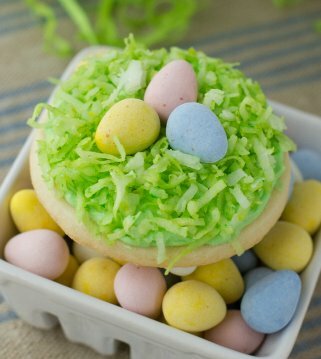 I made these for Easter and they are AMAZING. I think I could eat four in one sitting. Highly recommend this recipe! LOL!!! It is easy to do 🙂 Thanks for sharing! Yummy!!! Love carrot cake! These look so amazing! ???? I’ll have to try these. I hope you do!! They really are 🙂 Thank you! So yummy! I used 1/4 cup mashed banana and 1/4 avocado oil instead of canola oil to make it healthier and they were fantastic! Next time I might use a little but more spice. That’s a great option! I am so glad you liked them!! Thank you for sharing! GREAT RECIPE – made these cupcakes a couple times and just love them. My only struggle is the frosting. Often not stiff enough to pipe beautifully like your pictures? Any suggestions? Possibly beating too much? You may just need to add more powdered sugar. More will thicken it up 🙂 Thank you so much for trying them! I can’t wait to try these!! Did you use light or dark brown sugar for the frosting? I like to use light brown sugar 🙂 Hope you like them! Hi, this sounds amazingly delicious and simple! I was wondering how much, if at all, you try to squeeze the moisture out of the shredded carrots before using them. Yes, you can. I don’t think you need to though. It adds a little more moisture 🙂 But, you totally can, if you are worried about them being soggy. This recipe was awesome. Super moist and the taste is OMG..sublime. I made one small change…just added 1/2 cup crushed pineapples and just used 1 cup carrots…but hands down one of the best carrot cakes recipes I’ve come across. great recipe!!! ???????????? Love hearing that!!! Thank you so much for sharing & giving it a try! Can I use oat flour for this recipe? Hi, i was just wondering if i could use vegetable oil in place of the canola oil? You sure could 🙂 I hope you like them! Made these as mini cupcakes over the weekend. Delicious! Followed recipe exactly, and put one tablespoon batter in each mini muffin, It made 48 mini’s exactly, and took about 16 minutes at 350 to bake. I did pipe the frosting, and probably ended up with about 1/4 of the frosting leftover. Oh, and I also put some chopped pecans on top, because yum. Glad you liked them!! Adding pecans is a great idea 🙂 Thank you for sharing! Yay!! Love to hear that! Thank you so much for sharing that! My family loved the cupcakes. The cupcakes were gone in less than 24 hours. Just the right amount of sweetness in the icing. First time using sour cream in a carrot cake recipe, but it works. This recipe will be added to my monthly recipes to bake. Yay!! Sour cream makes them so moist! I am glad your family loved them. Thank you so much! I would lIke to make this cup cake, but I don’t have sour cream nor buttermilk, can I remove it? made it anD it’s delicious! My picky eater kid loved it, he repeatedly said ‘thank yoU Mom for the Super yummy cupCakes’! Thank You for sharing yoUr recIpe! Oh, that makes me so happy to hear!! Thank you so much for letting me know! I am so glad you like them!! Thank you for sharing this recipe with your family! i made these cupcakes the other day and they were amazing and super moist. do you think this batter would work for a cake? You know, I have never tried, but I don’t see why not?! I am glad you liked them! First time, i followed the instruction to a t and the cupcakea were fantastic. Had way too much feosting, so i froze half of it. Fast-forward to today and i Followed the recipe again, but baked thw batter in two small LoaF pans (350 for 40 minutes) and topped with the thawed frosting from before. I like Then even better as a loaf (you get thw slightly crunchy edges). Love this recipe – thank you for sharing! Thank you for sharing that!! I will have to try that! So I don’t usually leave comments, but I simply must with this recipe! These cupcakes, coupled with the frosting are absolutely amazing! I’ve had some recipes that haven’t turned out even when I followed them to the letter. not so with this one! Followed it exactly and they came out perfect!! I can’t say enough good things about this recipe! Thank you so very much for sharing your recipe!! Thank you so much for sharing that & for leaving a comment. I love to hear them! I am so glad you liked them! 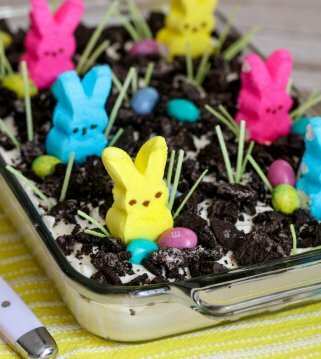 MAde this last year for Easter and I’m making them again this year. The frosting was a huge hit. But I cant remember if I used salted or unsalted butter. What do you use? Thank you! these turned out very nice I did tweak a few things. I added some applesauce to cut down on the oil. i used only half a cup of coconut sugar And I added a few raisins on top of the muffins because I forgot to add them into them. next time I will put crumbled walnuts on top of the muffins. and I may try pumpkin spice instead of cinnamon. Sounds perfect! Thank you so much for sharing that!